Known for its rich green foliage and white fan-like blooms, this easy to care for peace lily arrives seated in a classic white ceramic container, making it a simple fit with any home decor, and a kind gesture for any occasion. Measures Approximately 19" Tall. Size May Vary. if ordered by 9:30 am EDT Wednesday April 24th. White Peace Lily is a hand delivered gift. These gifts are delivered by one of our local design centers located throughout the United States and Canada. Same day delivery is available for most gifts when ordered before the cutoff time. The cutoff time for White Peace Lily is 6 AM in the recipient's time zone. 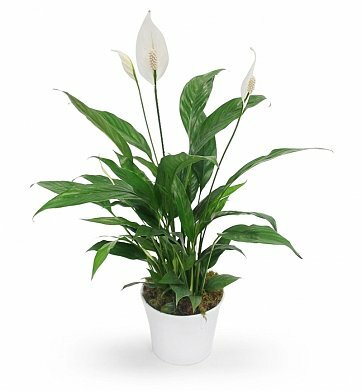 Bring serene elegance to any space with this gorgeous peace lily plant. White Peace Lily plant arrives in pot shown.